Since we wrote this article, a few things had changed in the world of studio headphones. Thankfully most of our earlier recommendations stood up to scrutiny, although we removed the AKG K271 MKII and the AKG K52, to make way for the exceptional Etymotic Research ER4SR, as well as an excellent budget option in the Samson SR850. Music production – it’s an industry that heavily relies on quality speakers and studio headphones. After all, these two devices are your only real connection with the music you are mixing. Where Do Studio Headphones Fit In? 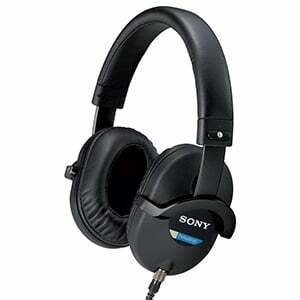 Traditionally, studio headphones have been considered to be a shortcut for real studio monitoring. However – as many top producers will testify – with the advanced performance and audio quality offered by modern headphones, this is no longer the case. Before we take a look at what the best studio headphones can offer and what to look out for when buying a new pair, let’s check out a rundown of the top 10 best studio headphones you can find on the market right now, spanning high-end, mid-range and affordable options. One of the most clinical open back headphones available on the market. Simple, effective and reliable tool designed to meet the demanding professional standards. Excellent pair of in-ear phones – flying the flag for IEMs! Currently one of the best bargain deals for proper, efficient studio monitoring. A hybrid that brings a combination of performance and insight that's rare. 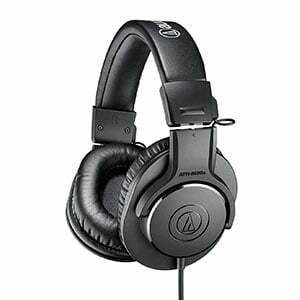 A proper set of studio monitoring headphones that bring lots of versatility. One of the best bang for the buck deals in their price range. Affordable yet effective solution optimize specifically for good performance and user comfort . An impressive solution for those who are limited by a tight budget. Affordable semi-open-back pair offering solid style, comfort and performance! Topping this list is an incredibly popular model from Shure, which remains the epitome of a good pair of studio headphones. With the SRH1840s, Shure went above and beyond to deliver a set of high-quality phones that gets the job done with both efficiency and style. It also doesn’t hurt that these are some of the best-looking high-end headphones on the market. Naturally, they are very comfortable to wear, while the sound is just excellent – very well balanced, with crystal clarity and a flat response. Check out the full SRH1840 review for all the details. For a long time, Sony’s MDR 7520 were regarded as the go-to choice for studio professionals and, in 2018, they remain one of the most popular pairs of studio headphones around. While they won’t win many awards for their unassuming design, it’s their comfort and performance that makes them a mainstay in studios around the world. As we highlight in the complete review of the Sony MDR 7520, this pair features a set of 50mm drivers with liquid crystal polymer film diaphragms, neodymium magnets and copper voice coils, translating to a superb response with great detail and definition – perfect for critical listeners. We had to add an in-ear pair of phones to this list and what better pair than the ER4SRs from Etymotic Research – the pioneers of IEMs. With sleek lightweight anodized metal bodies, this pair includes a wide range of both 3-flange and black foam tips to guarantee a solid, noise-isolating fit. Under the hood the ER4SRs feature balanced-armature custom-tuned drivers which results in a completely flat response across all frequencies. Ultimately this is one of the first in-ear pairs you should consider if you want an accurate sound for precision mixing. Be sure to check out the full ER4SR review! It’s no secret that the guys at Sennheiser know how to design a great set of headphones – if you needed proof, just take a look at the HD 600! Coming in at under $300, this open-backed pair shows off stunning performance for mid-range money. As we highlight in the full Sennheiser HD 600 review, features of this solid pair includes a meatily padded headband, comfortable velour ear pads, lightweight aluminum voice coils and neodymium ferrous magnet systems. This all translates to sensational dynamic response and a very natural, accurate and open sound that is so essential for critical listening. In a headphone world dominated by both open and closed-back headphones, Beyerdynamic’s semi-open-backed DT-880s feel like a breath of fresh air. In terms of build, this is a simple pair of cans, but one that feels both rugged and extremely comfortable to wear. This is largely down to the padded headband and thick velour-covered ear pads. The semi-open design of the DT-880 Pros provide a ‘best of both worlds’ sound, with the spaciousness of an open pair, and the power and reduced sound bleed of a closed-back design. There’s more on this reliable pair in the full DT-880 Pro review. The K553 Pro is a favorite from AKG which offers great style, build quality, performance and – at under $200 – a lot of bang for your buck. They have an uncluttered but attractive all-black design, with big closed-back padded ear cups for fantastic comfort. With a completely foldable build and low impedance, the K553 Pros are excellent for travel and use on the go. For the affordable price, the sound on offer is very good indeed – plenty of volume and fairly flat. For a more detailed look at this pair, give the K552 Pro full review a read. 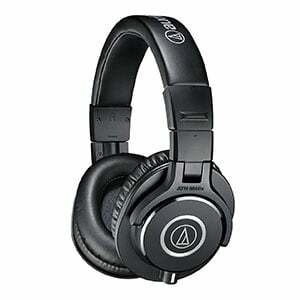 Firstly, the ATH-M40x are a very good-looking pair – far better in design than the sub-$100 price tag suggests. The padding along the headband and the ear pads makes this a very comfortable pair to wear for prolonged periods. This closed-back pair arrives with a detachable cable (in fact, it comes with two – both straight and coiled) as well as a handy carrying pouch and a screw-on 1/4” adapter. As we mention in the full Audio-Technica ATH-M40x review, this pair features an accurate sound and a low impedance, so use on the road is simple enough – especially when you consider the foldable design. Sitting in the lower end of this chart and Shure’s SRH series is the SRH440 – a very popular pair that arrives with a very good value price tag. Comfort is very good for an affordable pair of closed-back cans, with a lightweight design and plenty of padding on both the headband and the ear pads. These pads are removable, as is the 3-meter coiled detachable cable. For the low price, there is a surprisingly neutral and accurate sound – great for mixing and monitoring as well as general listening. There is more on the Shure SRH440 in the complete review. Coming in at under fifty bucks, the ATH-M20x is the lowest-priced member of the ATH M family, although it still demonstrates the same style and performance you’d expect from Audio Technica’s popular range. They sport a robust and comfortable design, with ample padding around the headband and cups. Of course, you can tell it’s not a premium pair, but the build quality is still very commendable. For the low price, there is a fairly flat sound with no heavy bias in either the low or high end, meaning these work well for monitoring on a budget – as we mention in the full review of the ATH-M20x. 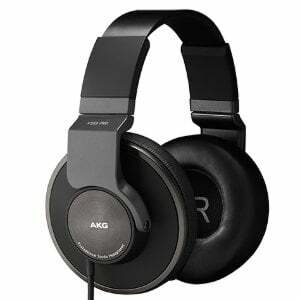 Propping up this list is another sub-$50 pair of studio headphones that ticks many boxes for us. For one, the SR850s offer a semi-open-back design for a full and open sound with less chance of interference from ambient noise. In the complete Samson SR850 review, we highlight that the build is very respectable too, as is comfort. They offer large circular velour ear pads, with a self-adjusting headband with a leatherette hammock. They also look pretty good too, with an attractive and sophisticated all-black design. We’d happily wear these for a good mixing session! One of the most heated arguments in the music production community is over whether or not studio headphones are a good way to mix music. One side is adamant that you can use headphones for successful mixing and recording, while the other insists that studio monitor speakers are the only way. As with many things in the world of music, the truth lies somewhere in the middle. We believe that the ideal solution is to mix on studio monitors and then review the same mix with a pair of headphones to catch anything that slipped through. In some senses, studio headphones act like a magnifying lens – or a safety net. You can also do things the other way around, by mixing 90% of the time on headphones, with occasional monitor checks. One complements the other. However, not everyone can afford both a good set of monitors and a good set of headphones immediately, so using just one of these alone may have to suffice. The one you settle on will be down to you, your studio setup, your budget and other aspects. However, if you can stretch the budget to include both monitors and phones, you may start seeing better results in your mixing. The main draw to closed-back headphones is that, by sealing the drivers, the phones should eliminate all outside noise, leaving you in a cocoon of your own mix. Closed-back phones also keep that mix private, as the sound bleed is minimal to non-existent. The benefit of this immersion is that it should give you a good insight into the finest details of whatever project you are working on. In the context of studio use, closed-back headphones are the preferred tool for recording. This is because, as well as driving the instrument or vocal performance right into your ears, they will protect you from hearing any ambient instrument sounds or noises. At the complete opposite end of the headphone spectrum we have open-back headphones. Where closed-back phones have sealed driver housings, open-back pairs come with a fully transparent driver enclosure. The downside to this is obvious – the ability of these headphones to protect from external noise is very poor. However, this is a small price to pay for such a natural and airy sound that adds a spatial dimension to your music. In other words, the sound produced by these headphones creates the illusion of a soundstage. You can pinpoint exactly where the sound of each instrument is coming from relative to the headphones. Open-back headphones are mostly used for mixing music as they give you a better handle on how the mix is arranged, while offering a more comfortable experience for long studio sessions. The only issue here is that, due to the sound bleed, you have to use them in a quiet environment. Naturally, there are a few alternatives to the two most popular styles – and one of these is semi-open-back phones. As the name suggests, this rarely-seen style is a compromise between open and closed-back headphones, providing slightly better isolation than the former, while still offering a relatively open sound. The actual benefits (and even the exact definition) is up for debate in the music community, although there are people who swear by from this hybrid style. Pioneered by Etymotic Research more than 30 years ago, in-ear headphones or IEMs (in-ear monitors) are those that sit inside the ear canal. These are often supplied with a range of tip sizes and materials to help individuals attain the best fit. Providing you can find a good fit, you can seal out the rest of the world and achieve excellent sound quality for mixing and monitoring. The other benefits of this style include the fact that they are very portable and very lightweight. The most important aspect of studio headphones is whether they can offer you a transparent tone, allowing you to hear the music as it really is. This transparency can be referred to as a natural, accurate sound with a flat response. Ultimately you don’t want big booming bass or peaks in other frequencies – you want the whole sound to be well balanced. This is why studio headphones can sound a bit odd to general consumers. Comfort is one of the most underrated yet most essential aspects of headphone design. Ultimately, these things are going to be on – or in – your ears for hours at a time, which can inevitably lead to fatigue (i.e. your ears start to hurt, your head starts to ache – neither of which is something you want to experience when working in a studio). This is why aspects such as padding for both the headband and the ear pads are essential here. You will also want something that offers a snug fit, but is fully adjustable. The build quality of a pair of studio phones will largely depend on the price of the headphones. As you may expect, higher-end cans are usually made to last much longer, whereas a budget pair are less durable. If your budget allows, look for something that has a metal frame, which will prove more robust over time. The cables a pair of phones comes with are also an issue that you should consider. While cheaper phones tend to have fixed cables, the standard for mid-range and high-end headphones is to have a detachable cable. This allows for a bit of versatility. Firstly, you can change the cable to a length or style (straight or coiled) that suits you, while you can also replace cables if they break (and, in studios, this is more often the first part of a headphones to be damaged). As you begin to rise out of the budget price ranges, you will find that headphones come with two or three different cables. Whatever price range you shop in and whatever model you end up with, you may notice a little creaking sound in the phones. This annoying noise is quite normal for headphones, although it’s more common in the budget and lower-end markets. This problem is usually down to a plastic part rubbing against another component. Some users report that applying a little oil, wax or petroleum jelly – even powdered Teflon – to the contact point can go a long way to remedying this problem. While we agree with this point, you always run the risk of damaging the plastic with certain lubricants. You may want to do a search for your specific pair to see if others have had this problem and how they have dealt with it, or contact the manufacturer directly. 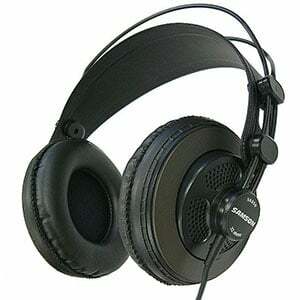 As we have covered, studio headphones are an essential tool in the world of music recording and production. There are many models out there, but those we have highlighted today represent some of the best on the market, across a wide spectrum of price ranges. If you are on a limited budget, hopefully this guide has shown you that there are some awesome headphones that don’t cost a fortune. If you have a fortune to spend… well, get ready to enjoy the very best studio headphones on the market! Take your time to read reviews and, if possible, try out some pairs on your shortlist before you buy. Good luck with your new phones! Can you address the issue of creaking/squeaking noise coming from the headphones themselves, e.g. the headband, the padding, etc, whenever the wearer moves his head or jaw? I have this problem with an expensive pair of Shure headphones and I’m really over it. How often is this a problem, and which brands overcome the issue? It looks like they have done it!